Mon-Fri: 7.30 a.m. to 2 a.m.
Sat-Sun: 8 a.m. to 2 a.m.
From Sunday to Thursday the kitchen closes at 00:30 a.m.
On Friday and Saturday the kitchen closes at 1 a.m.
Our Clients can park their car at the GARAGE PROPERZIO, in Via Properzio, 11. 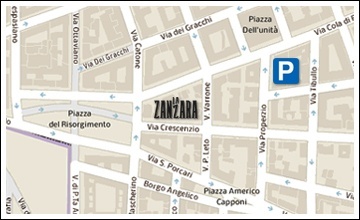 All days, only for evening meals, SPECIAL PRICE, starting from 8 p.m. until 1 a.m., only 150 mt distance. WARNING: make a reservation request with a minimum of 2 days in advance, you can not book for the aperitif. The undersigned agrees to sending of the "Personal Information" for the purposes indicated in the treatment according to Art. 13, Legislative Decree no. 196/2003.